For many years, we have been shameless consumers of Bath & Body Works Foaming Hand Soap. It is so easy! It smells so pretty! You can always get a double discount! I wonder if I can just make my own? It was not a small project. The dollars saved were not worth the trouble. 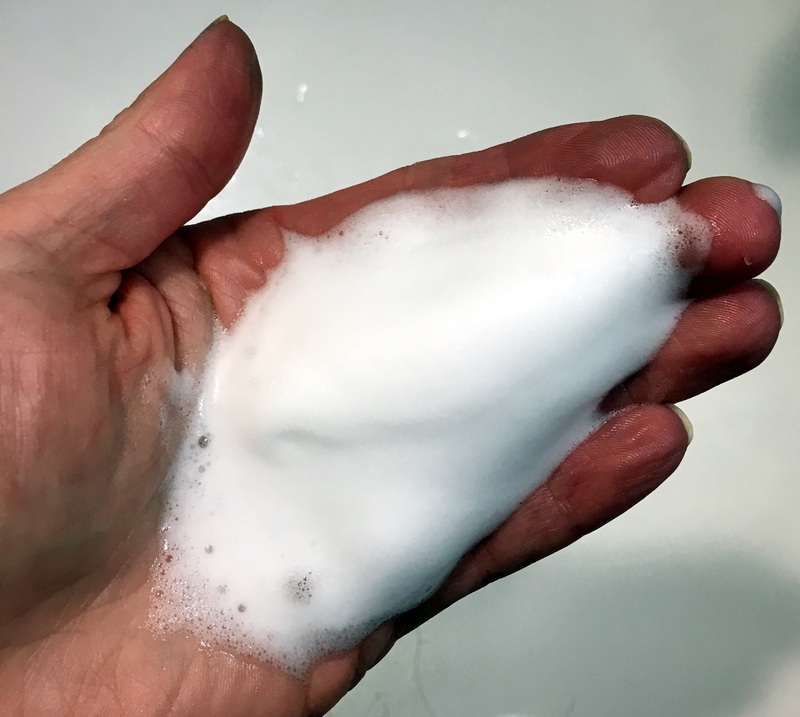 I kinda figured that I would land in a similar spot with the hand soap, but I looked online and found a ridiculously simple formula without even trying. Then I took a look in that section of Whole Foods. 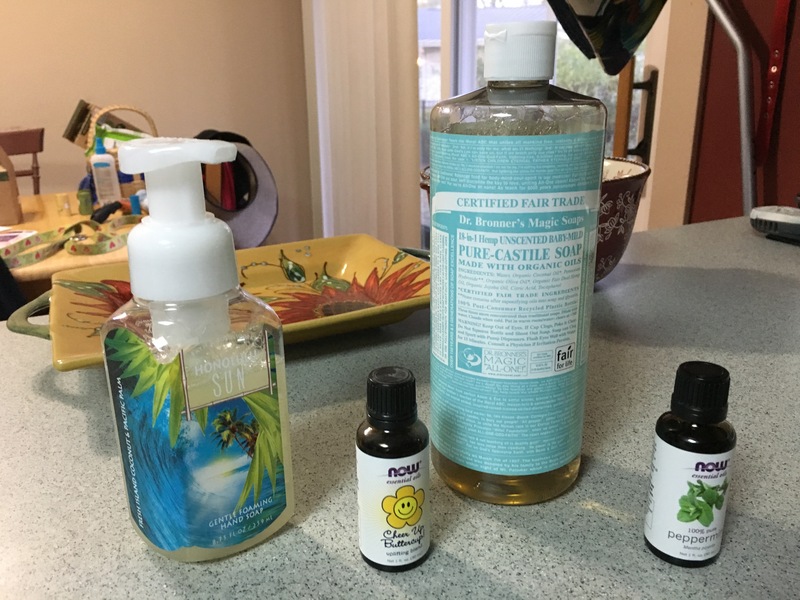 A great big bottle of Castile soap was.. $12 or $13. I still had that bottle of essential oil from last winter and I liked it a lot, but while I was on this kick I bought a bottle of peppermint. Incidentally, Castile soap has its own scents, but since I was buying the big bottle I went with Unscented. But what about the container? Whole Foods only had one tiny bottle with a soap dispenser. I figured I could just reuse an old one in my house. So the total cost of this experiment was in the neighborhood of $20. I rinsed out the old dispenser and put in a bit of the Castile soap. Then I shook in some essential oil and filled the bottle almost to the top with water. It didn’t take much to mix the liquids. The post said the soap would be much thinner than we are used to, which was true. Then I wondered..could I just use this formula in a foaming dispenser? The foam isn’t quite as..fluffy as the commercial brands I’ve tried, and I use a bit more each time I wash my hands. Three pumps instead of one or two. Still waaaaaaayy less expensive than buying bottles of the stuff. I made four bottles of this mixture and barely put a dent into the big container of Castile Soap. Distilled water instead of tap. One site said that distilled should be used if you don’t think you will use up an entire bottle within a couple of weeks. Distilled water isn’t all that expensive and of course, one can always boil water. I’m thinking I might use distilled if I were gifting it, but my filtered tap will do for my house. The mixture settles and separates a bit. I just turn the bottle upside down every once in awhile. I feel squeaky clean after washing my hands..and dry. Some posts suggest putting olive/almond/choose your own oil in there. One even suggested that would be better for the dispenser in the longer term. I haven’t tried that yet. Overall, I am very pleased. My mother was thinking “stocking stuffers” and went to Amazon and found some foaming dispensers. For gifting, I think that’s the way to go. But I will be re-using for as long as I can. This entry was posted in Health and Wellness, I'm Not a Tree Hugger, Spa Junkie.